Really? This one comes to you straight from the sketchy rumor department and even includes a piece of visual “proof.” There is at least one AT&T Store out there taking $100 deposits for Apple’s next-generation smartphone. Are you ready to pre-order the iPhone 5? Then step inside for the full details, such as they are. Quoting reliable sources, Tapscape reported back in mid-August that iPhone 5 pre-orders would begin on September 12 — the day Apple will introduce their sixth-generation smartphone to the world. And, as repeated everywhere, iPhone 5 orders will arrive starting September 21. Now, however, there is a new wrinkle to the story. 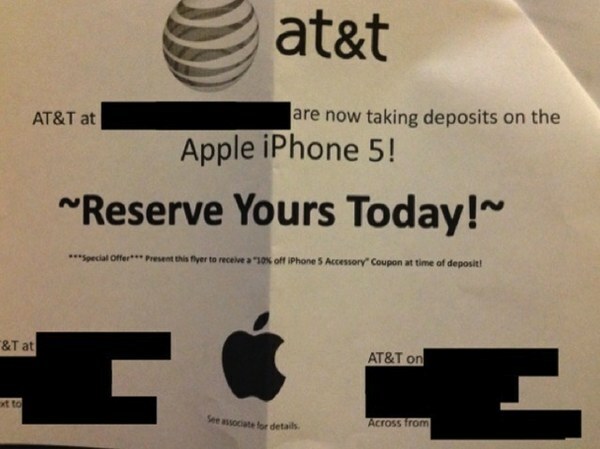 Reddit poster xyphonic claims that his local AT&T Store — a corporate store, not a franchise — is accepting iPhone 5 pre-orders for a $100 deposit. An expurgated photo of a notice placed in the AT&T Store’s window. The manager … said this year they aren’t going to have a line on launch day and all phones they get will be sold through reservations. He was just referring to that particular store though. He estimated they would receive 15 units per day for the first week. Well, my name is now first on the list. I had to put down a $100 deposit but it came with a coupon for 15 percent off one accessory. They told me to stop in after the announcement on the 12th to choose what model I want. 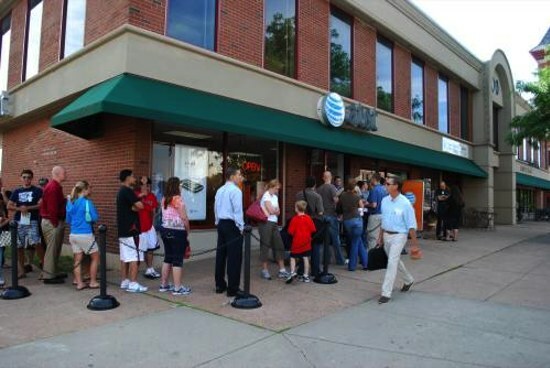 One specific AT&T Store is taking iPhone 5 pre-orders essentially on its own account? Also, if AT&T Store managers had an iPhone 5 PowerPoint deck, it’s hard to imagine the world + dog wouldn’t have already seen it. Whatever the case, this story is out there.